Every trainer will tell you that they’ve long suspected that owner personality seems to have a huge impact on dog behaviour. I remember saying to a colleague once that I just couldn’t help but notice that it always seems that the most hyper-vigilant, anxious owners are often the ones whose dogs end up with behaviour problems. Furthermore, they are often the ones “doing everything right”. They come to every puppy class, they socialize their puppy often and well, they read every single book on dog behaviour and yet, their puppies get worse and worse. We come into these homes as trainers and are completely stumped because there’s so little we can tell them that they don’t already know and likely haven’t already tried. Dr. Dodman has decided to pull up his boot straps and really dig in on a HUGE study about this phenomenon. He plans on interviewing hundreds of dog owners to establish “once and for all how owner personality and and psychological status affect a pet’s behaviour”. Anyone else excited to see what the results will be? Let me say before I sign off that I don’t think every person should be problem-free in order to own a dog! We live in a time when the majority of us struggle with anxiety and depression in some form or another at a given point in our lives. 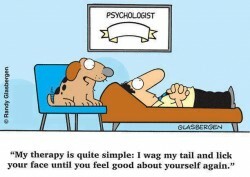 Please don’t think you should feel any guilt if your dog does develop behaviour problems. However, it can be very helpful from a diagnostic perspective and perhaps we could even use our dog’s behaviour as a barometer of our own mental health! This could give us as trainers a distinct advantage and increase our chances of success in a major way. Not only would rescues be better able to place dogs in appropriate homes, but we may be able to better isolate the cause of many of these unknown behaviour problems that often leave us banging our heads against a wall! Makes me wonder if in the future, trainers will have to add a roster of Therapists and Counsellors to their list of referrals!